FIGURE 7.1 Atomic structure of botulinum neurotoxin type A. Ribbon (1A) and space filling (1B) models of the X-ray crystal structure of botulinum neurotoxin type A (ref. 64). 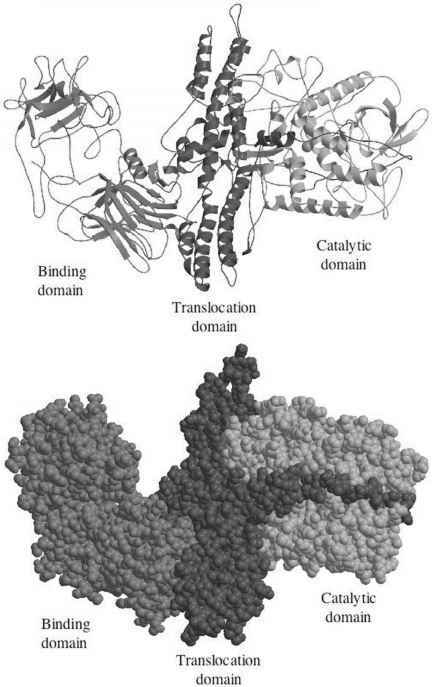 The toxin consists of a binding domain, translocation domain, and catalytic domain, as described in detail in the text. resulting in blockade of neuromuscular transmission74'75 (Figures 7.2 and 7.3). 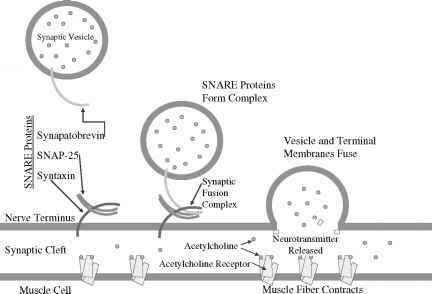 The SNAREs are essential for normal fusion of the synaptic vesicle and acetylcholine release (Figure 7.1). Toxin serotypes A and E cleave distinct sites within SNAP-25 (synaptosomal-associated protein of 25kDa);75-78 serotypes B, D, F and G cleave distinct sites within vesicle associated membrane protein (VAMP, also known as synaptobrevin);74'75'79-82 and serotype C cleaves syntaxin and SNAP-25 (Figure 7.3).83'84 These three SNARE proteins (syntaxin, SNAP-25, and synaptobrevin) interact to form a four-helix coiled-coil in a step that precedes synaptic fusion85 (Figure 7.2). Cleavage of any one of these proteins blocks fusion and acetylcholine release, leading to a flaccid paralysis. FIGURE 7.2 Normal neuromuscular transmission. Synaptic vesicles containing acetylcholine have the soluble -N-ethylmaleimide-sensitive factor attachment protein receptor (SNARE) synap-tobrevin on their surfaces. Vesicular synaptobrevin interacts with the SNARE proteins syntaxin and synaptosomal-associated protein of 25 kDa (SNAP-25) to form a four-helix coiled-coil resulting in fusion of the synaptic vesicle with the presynaptic membrane. Acetylcholine is released from the vesicle, diffuses across the synaptic cleft, and binds to the acetylcholine receptor, resulting in normal muscle contraction. FIGURE 7.3 Effect of botulinum neurotoxin on normal neuromuscular transmission. Botulinum neurotoxin binds to unknown receptors on the presynaptic neuron membrane, resulting in endo-cytosis of the toxin. After endocytosis, the translocation domain changes conformation, resulting in release of the catalytic domain into the cytosol. Depending on the toxin serotype, the catalytic domain cleaves one or more members of the SNARE protein family. SNARE cleavage prevents formation of the SNARE complex and fusion of the vesicle with the membrane. 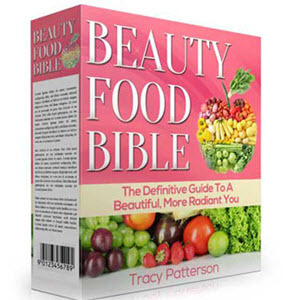 As a result, acetyl-choline is not released. 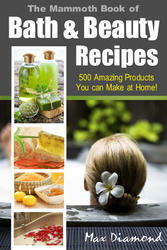 This electronic book has all you will ever need for making homemade bath and beauty products in one place.